A Social Security Disability Lawyer Works Thru the Bureaucracy Based on Experience And Training. For the best outcome in your case, hire a Social Security disability lawyer in Wilmington to fight for you. Greg Kornegay is that lawyer. Most Social Security Disability claims are denied in the beginning stages of the process. 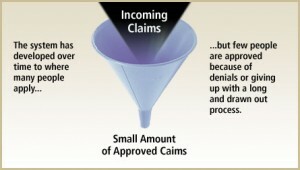 This is the bureaucratic funnel that the government uses to discourage folks from applying and proceeding forward with their case. Two appeals must be done prior to a hearing – request for reconsideration and request for hearing. An experienced Social Security disability lawyer will know how to properly file each appeal electronically with the Social Security Administration. However, it is at the hearing level that your case will have the greatest chance of being decided favorably. It is at the hearing level that your case will be assigned a judge to hear the evidence. This judge is known as an administrative law judge or ALJ. There are 4 hearings offices in North Carolina with an average hearing wait time of around 15 months. Most people are not going to have the knowledge and skill required to adequately prepare their disability case for hearing before the judge. Social Security disability cases have a blend of facts, medical evidence, and law. Knowing when to apply the Social Security rules to a particular fact or medical finding is how a Social Security disability lawyer makes their living. An experienced Social Security disability attorney will know which questions to ask your treating doctor and medical sources in order to get the correct medical evidence. The right medical evidence increases the chances of a favorable decision. An attorney that is familiar with Social Security disability cases can advise you on the questions the judge may ask of you. You will feel more at ease if you know what areas of your case the judge may ask you about. Of course the biggest area for questioning will be functional limitations. Your Social Security disability lawyer may also have to ask the judge to schedule a psychological or physical exam on your behalf, to be paid for by the Social Security Administration. Normally, at most hearings, there will be a consultant hired by the Social Security Administration. This consultant is called a Vocational Expert. The Social Security judge will ask the Vocational Expert questions about your ability to work. These questions are phrased as hypotheticals. The hypotheticals contain your work restrictions as interpreted by the judge. In other words, the judge will set your work restrictions based on his or her interpretations of the medical evidence and then ask the Vocational Expert if you can work based on those restrictions. It is not uncommon for the judge to ask several hypotheticals during a hearing. This can be quite complicated and subject to much interpretation. This alone could serve as a reason to hire a Social Security disability lawyer since your lawyer will have an opportunity to question the Vocational Expert about their opinion. Social Security lawyer fees are contingent upon winning the case. A Social Security lawyer only gets paid if you win. This type of attorney’s fee is known as a contingency fee. There is an incentive for the lawyer to do a good job. Sometimes, it may be difficult to obtain medical records from a particular medical source. Some medical sources may respond better to an attorney’s request for records instead of the patient’s request. It may be necessary for the Social Security lawyer to jump in their own car and drive to the medical source to obtain records or reports- when nothing else works. It may be necessary to interview other witnesses who are familiar with your functional limitations. It is this extra amount of attention that may mean the difference between winning and losing. The incentive to win usually means the Social Security lawyer will do whatever it takes within the rules to present the case in the most favorable way. Normally, after a Social Security disability case is won, in addition to a monthly amount of Social Security benefits, there is also a back pay benefit amount that will be paid in a lump sum. The back pay amount is determined by the “onset date”. The onset date of your disability is determined by the administrative law judge in your case. Sometimes, a Social Security disability lawyer can argue for and obtain an earlier onset date based on the medical evidence. The earlier onset date will increase the award amount since the back pay is based on the number of months you were denied disability payments. It goes without saying, that if you are not represented by a Social Security lawyer, the government is going to pick the latest onset date possible – to keep your award amount lower. If you have no advocate, you may have no voice in the determination of this onset date. Many times a Social Security disability lawyer will have already appeared in front of the judge assigned to your case. This can be a tremendous help in deciding how to present the case for the best result. Specific requirements on how to present a case can vary from judge to judge. A review of Administrative Law Judge case statistics shows how variable the outcome of cases can be depending on the judge.